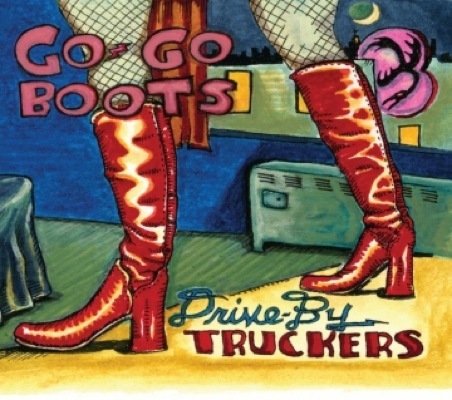 I have to admit that I was a little bit concerned when I first heard that Drive-By Truckers would be releasing their new album Go-Go Boots so close on the heels of The Big To-Do. Of course it was utterly foolish of me to be skeptical. 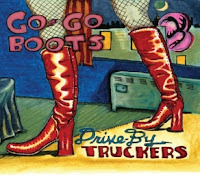 The new album sees the Truckers doing everything they do so well. They've got the perfected the southern indie rock sound and they don't shy away from giving us more doses of that with toe-tappers like "Cartoon Gold" and old school country numbers like "The Weakest Man". Soul, bordering on gospel, makes itself known during the stellar "Everybody Needs Love". The classic rock touches on "Ray's Automatic Weapon" bring that touching confessional even stronger. The band even show a keen pop ear with the immediately catchy lead track "I Do Believe". Patterson Hood's wry sense of humour is still on display. This time around the best example of that comes on the self-deprecating "Assholes". Once again, it's Shona Tucker and her relatively new-found voice within the band that provides some of the brightest highlights. On "Dancin' Ricky" she delivers a nuanced performance worthy of Margo Timmins, while she goes in the completely opposite direction on "Where's Eddie", with her booming vocals in the chorus. There are a couple of lulls over the course of the 14-tracks here. "The Fireplace Poker" is an unremarkable toss away track. Despite an intriguing storyline, "Used To Be A Cop" doesn't deliver enough on the arrangements side to warrant investing 7 minutes into listening to it. Best tracks: "Ray's Automatic Weapon", "Everybody Needs Love"
Great review, have a friend that's constantly harping on about the virtues of DBT, but this is the first album of there's I've really been into.